Single material batteries; seeing perovskite’s flaws; overheating lithium-ion X-rayed. Engineers at the University of Maryland created a battery made entirely out of a single material that, by incorporating the properties of both the electrodes and electrolyte, can both move electricity and store it. “Our battery is 600 microns thick, about the size of a dime, whereas conventional solid state batteries are thin films — forty times thinner. This means that more energy can be stored in our battery,” said Fudong Han, the first author of the paper and a graduate student at UMD. The new material consists of a mix of sulfur, germanium, phosphorus and lithium. This compound is used as the ion-moving electrolyte. At each end, the scientists added carbon to this electrolyte to form electrodes that push the ions back and forth through the electrolyte as the battery charges and discharges. Sulfide-based compounds are not particularly environmentally friendly materials, Han said. “So next we will try to use oxides, which do not degrade into a poisonous gas, instead.” The battery’s solid powder is, however, safer than the current liquid-based batteries. A new study from the University of Washington and Oxford University suggests that perovskite materials, generally believed to be uniform in composition, actually contain flaws that can be engineered to further improve the material’s prospects in solar devices. The research team used a technique called confocal optical microscopy. Often used in biology, the team applied it to semiconductor technology to find defects in the perovskite films that limit the movement of charges and limit the efficiency of the devices. Perovskite solar cells have so far have achieved efficiencies of roughly 20%, compared to about 25% for silicon-based solar cells. By correlating fluorescent images with electron microscopy images, the team identified ‘dark’ or poorly performing regions of the perovskite material at intersections of the crystals. This surprising result held true even for samples corresponding to the state-of-the-art solar cell efficiencies. In addition, they discovered that they could ‘turn on’ some of the dark areas by using a simple chemical treatment. “Surprisingly, this result shows that even what are being called good, or highly-efficient perovskite films today still are ‘bad’ compared to what they could be. This provides a clear target for future researchers seeking to improve and grow the materials,” said David Ginger, professor of chemistry at UW. 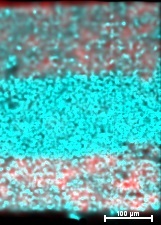 The imaging technique also offers an easy way to identify previously undiscovered flaws in perovskite materials and to pinpoint areas where their composition can be chemically altered to boost performance. What happens when lithium-ion batteries overheat and explode has been tracked inside and out for the first time. Using high energy synchrotron X-rays and thermal imaging, a team led by researchers from University College London got a look at how internal structural damage to batteries evolves in real-time, and an indication of how this can spread to neighboring batteries. 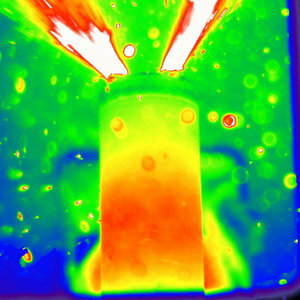 The team looked at the effects of gas pockets forming, venting and increasing temperatures on the layers inside two distinct commercial Li-ion batteries as they exposed the battery shells to temperatures in excess of 250 degrees C.
The battery with an internal support remained largely intact up until the initiation of thermal runaway, at which point the copper material inside the cell melted indicating temperatures up to ~1000 degrees C. This heat spread from the inside to the outside of the battery causing thermal runaway. In contrast, the battery without an internal support exploded, causing the entire cap of the battery to detach and its contents to eject. Prior to thermal runaway, the tightly packed core collapsed, increasing the risk of severe internal short circuits and damage to neighboring objects.